Another wonderful day on the sunny south east! 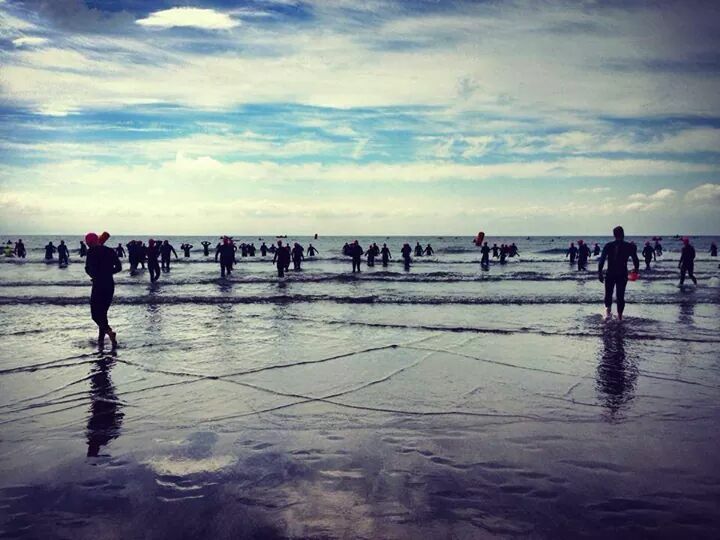 Saturday June 28th, 2014 will go down as a red-letter day in Dungarvan sporting annals as the local Tried & Tested Triathlon Club held its inaugural Dungarvan Triathlon at the beautiful Clonea beach. The sun shone brightly, and calm sea conditions brought a huge sigh of relief to the organising committee and competitors alike. This was my first triathlon. To be sure, I was not alone as there were 42 club members taking on the challenge for the first time. We had trained well, under the watchful eye of experienced triathletes. We had taken on board all the hundreds of tips and tricks. We had, in short, been tried and tested. I arrived just after 8.30am, to find that the place was buzzing. As we racked our bikes, prepared our gear and double-checked everything, there was plenty time to relax and chat. For me, this was a great way to calm the little floating butterflies. However, as briefing time approached, we turned slightly inward and the banter lessened. I went for a short jog on the beach with Paddy, very short really. I was happy just to walk back at my leisure to get into my wetsuit. Following our safety briefing by Dave, we walked to the far end of Clonea beach and entered the water for a few minutes of acclimatisation. I remembered the advice: use this time wisely. Warm up, swim for 10 / 20 seconds, stand, stretch, relax, repeat. No time for chatting now. This was it! Months of training just for this moment. I had decided to swim on the right edge of the group, as there was a slight tailwind and current in my favour. Overall, my swim went well. We were in the expert hands of 22 kayakers. For the first time I noticed that my breathing was better, and I was able to swim longer sections with my head in the water. I did take my little sculling breaks on my back every now and then, and was pleasantly surprised that when I passed the final buoy at 600 metres I was not as tired as in previous training swims. The final stretch back to the beach was easier, and I was focused entirely on the Powerbar flags at the water edge. Finally, after 27 minutes or so I emerged. The photo shows how much it took out of me, but in fact, I recovered quickly for the bike section. 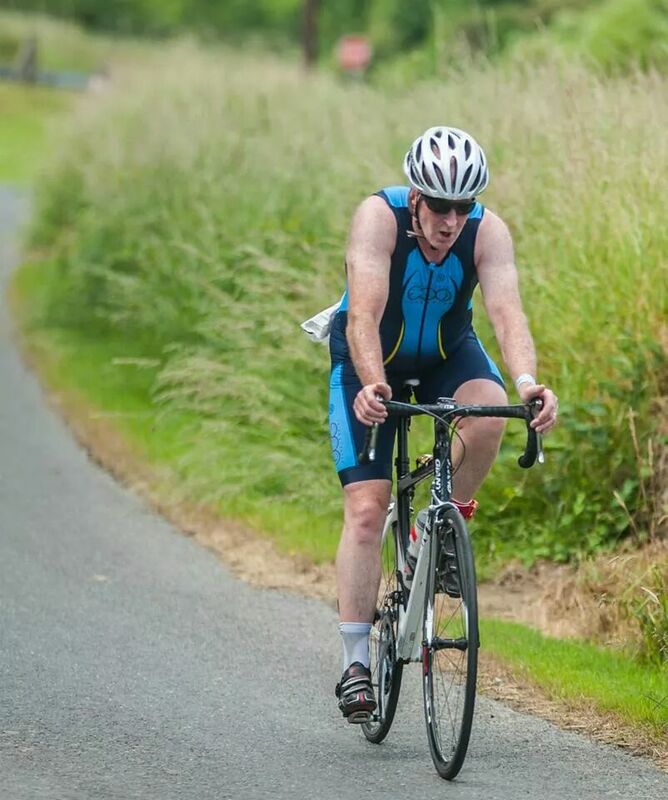 This being my strongest sport, I pushed as hard as possible into a very slight headwind to Stradbally. I eased into it to Ballinroad roundabout, and increased the effort near Garranbane. The climb to Ballyvoile hurt me, and the heat was intense. From there to the quarry after the river Tay I was able to recover a bit, knowing that the part of the course where it’s easiest to lose time is from the Tay bridge to the turning point at Five-Cross-Roads. And therefore, I was thrilled to see that the course was slightly shortened for safety reasons. The return to Clonea was fast, with a lovely tailwind, and I pushed very hard. Unfortunately at the Crooked Bridge near Ballinroad there were two cars in my path. In all fairness, they had nowhere to go as they had cyclists ahead. I eased off through the chicane, and pushed on hard to the roundabout. Here too, the same situation. I was a bit cheesed off, but looking back now, it gave me just a very short breathing space to prepare myself for an all-out assault on the final flat section to Clonea. My transition to the run was quick. But the run itself was not! I had very little left, and plodded around slowly. The spectators and marshals along the route kept me going, and as it turned out, only one competitor passed me. My brother Ray was at the 400-to-go point, and as I passed he gave his usual advice. “Don’t have a lame finish! Go HARD”. So I did…and I was glad I did! I raced it. The huge crowd for the last 100 metres was really special, as I heard my name shouted over and over by unknown unseens! I did indulge at about 20 metres to the line as I clapped over my head…and finished with a sprint. Tried & tested. Passed! Immediately after, I met up with many many fellow club members and marshals. We shared stories and high-fives. We waited to cheer home other club members. We sipped, munched and chatted. Triathletes all! 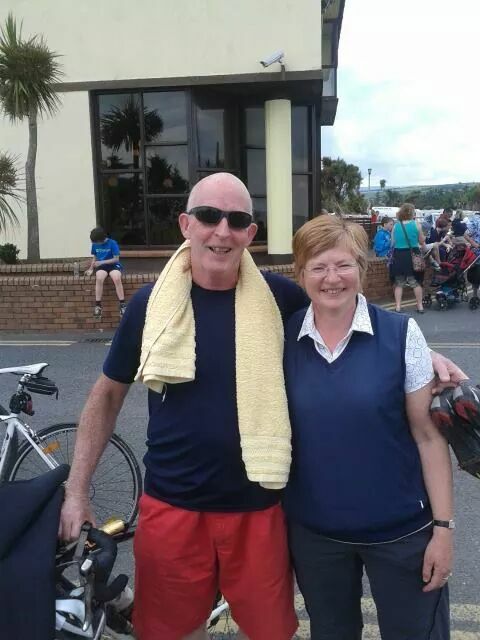 Joey in Clonea Leisure Centre offered me a bed, but a stint in the jacuzzi followed by a long cold shower brought me back to life, and again as we lingered in the warm sunshine, posing for remembrance photos, I enjoyed Ivor’s delicious ice-cream. The presentations took place shortly after, again in blazing sunshine, and as I cycled slowly back home, I was able to take it all in. Later that evening, we enjoyed a great get-together at the Moorings in Dungarvan, as we listened to the playback over and over again, until such time as voices became slightly blurred and the effort of the day seemed to take its toll. No matter, roll on 2015. Tried & Tested Triathlon Club is in its infancy. Founded in 2012, this was its first hosting event. And what a super show it put on! Serious kudos to all involved, especially Dave, race director for the day. Actually, that does him a disservice because he has worked tirelessly in this role since last Autumn. I recall cycling with Dave back in early spring, and what struck me was his determination to ensure that this new club would cater equally for the few on the top of the charts, for the many mid-table members and for the back-of-the-pack stars. Chapeau Dave! 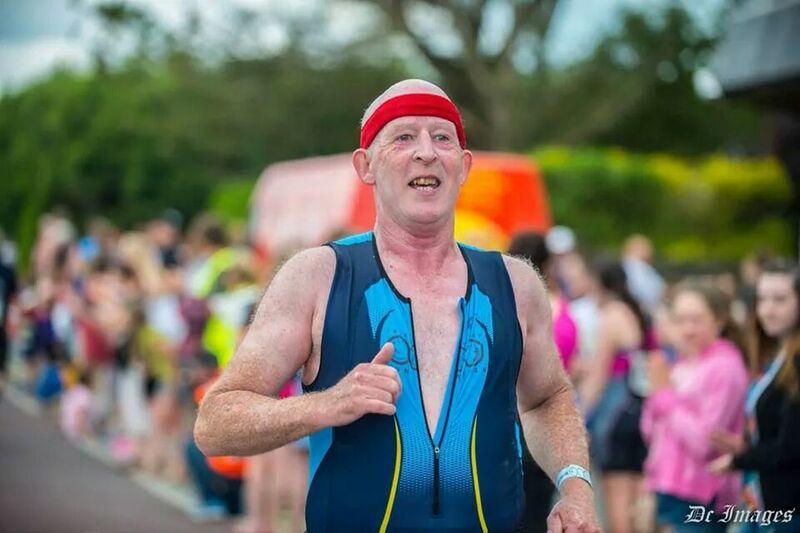 Your determination and vision brought 42 new members into triathlonland. I want to thank all the club members who helped out. One competitor mentioned that there were nearly as many marshals as athletes. Their support and encouragement was immense! Finally, I want to say a very big thank you to two wonderful coaches….Ann in Clonea Leisure Centre and Natalie. Ann got me started in mid-December. Three lessons, then she told me to go and practice what she taught me! It took me until mid-January to swim a length of the pool, and I never looked back after that. Natalie taught a weekly lesson right through the spring. She coaxed, encouraged, pushed and guided me and many others. But here’s the thing: I specifically remember one session back in March when I was close to packing it in. Natalie had the insight to just leave me alone and muddle my way through my doubts! By early June, although my swimming stamina was still missing, I KNEW deep down that I would complete my first triathlon. 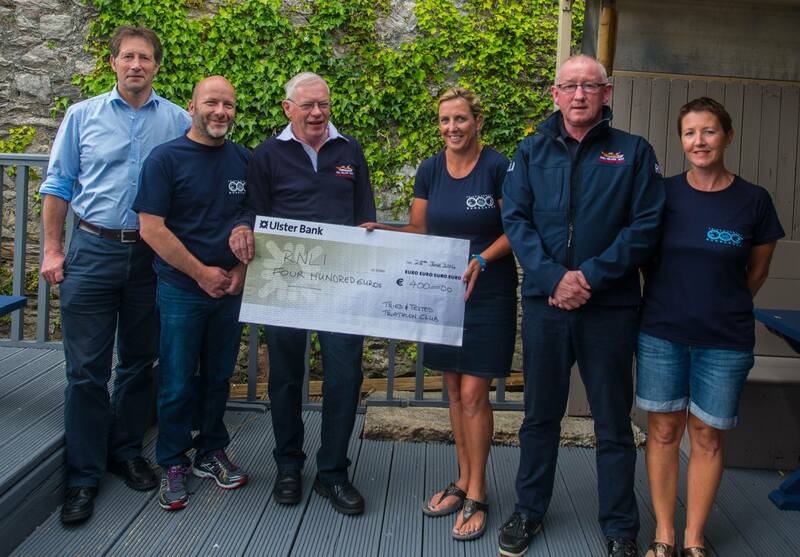 Finally, finally: I thought it was very fitting that Tried & Tested Triathlon club made to make a financial contribution to Dungarvan Bay and Helvick Head RNLI Fundraising Branch. For a selection of event photos check here. Also theres a complete set of event albums here. So, what comes next? Lots of cycling in July and August as I prepare for Endurance Challenge 2068. I will be cycling the nine counties of Ulster and the six of Munster over five days in mid-August. Monday 11th: Armagh Town to Derry City. To view a map of this route click here. Tuesday 12th: Derry City to Enniskillen. Via: Strabane, Donegal Town, Ballyshannon. Wednesday 13th: Enniskillen to Armagh. Sunday 17th: Cork City to Limerick City. Monday 18th: Limerick City to Cork City. For triatltetes out there, what are your memories of your first one? 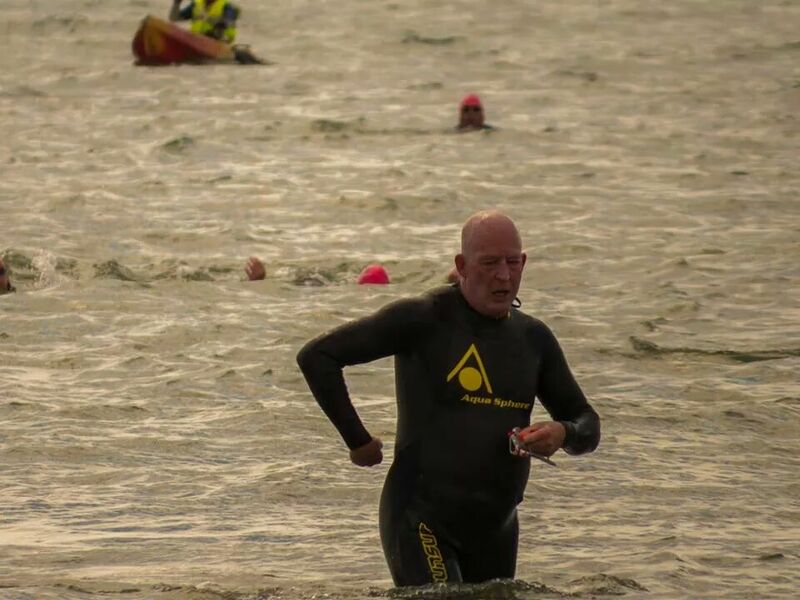 Did you compete at the Dungarvan Triathlon? Want to share your experience? Why is an important day called a “red-letter-day”?